Lately I've been reading manga aimed at teen boys. Which has turned out to equal two things: (1) Relateable and likable characters; and (2) Lots of close-ups on female underwear and the body parts they cover. Tsukene, our leading man, clicked with me immediately. He's an ordinary boy who ends at a school for monsters by accident. He has to hide the fact that he's not a monster himself or all the monsters would kill him. Tsukene is pretty bland. When Moka throws herself at him, he's surprisingly okay with getting his blood sucked. After all, she's pretty and nice. He mostly seems to bumble through life. The first person he meets at this school is a vampire named Moka. She's very Manic Pixie Dream Girlish. Giggles, sweetness, and smiles. Plus, sinking her teeth into Tsukene at every opportunity. Until she goes all vampirey and turns into a female version of the Hulk. The plot of Rosario Vampire appears to involve various classmates turning into monsters and attacking Tsukene or Moka in turn. When one is attacked, the other rescues him or her. It's nothing I haven't read before, but still fun. And I like that it's an equal opportunity rescue scenario. As you might guess, I'd happily skip the focus on the female body parts. I understand that its thrown in there to appeal to high school boys, so I'm willing to roll my eyes and move on. I don't see what would be so appealing about a blank and white drawing of a fake girl's underwear...but I suppose it doesn't take much for a teenage boy. 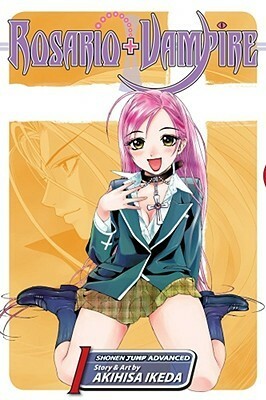 Rosario Vampire is pretty silly, but has that intangible it factor that makes me want to keep reading. On to the next volume! You are so right about the way females are portrayed in teenage boy manga xD This does sound pretty interesting if you can get past all that other... stuff. Manga Mondays? That's a great idea!! Next monday I'll start !! By the way I'm your new follower!! Your blog is awesome!! I loved your ideas!!! I tried getting into this series, both the manga and the anime, but I had a hard time getting into it. I still have some of the manga, so perhaps I'll give it another try. Sometimes, I find that there is a right time for a book and it's not always when you first sit down and try to read it.